Applications are invited from Indian Citizens in Standard Form of application prescribed in Part-IX of Assam Gazette for filling up following mentioned posts of Lower Division Assistants( Junior Division Assistant) to be submitted to the Member Secretary of the concerned educational institutions under Jorhat District. Kalyani H.S., P.O- Kalyani, Jorhat. Bahona Boys’ H.S., P.O.- Bahona, Jorhat. Karanga Girls’ H.S., P.O.-Karanga, Jorhat. Birinasayek H.S., P.O.- Birinasayek, Titabar. R.K.B. Public H.S., P.O- Kenduguri, Jorhat. Sankardev Seminary, P.O.- Jorhat, Jorhat. Teok Rajabari H.S.S., P.O.- Teok Rajabari, Jorhat. Nahotia H.S.S., P.O.- Nahotia, Jorhat. Kakojan Girls’ H.S., P.O.- Kakojan, Jorhat. Namdeuri H.S.S., P.O.- Namudeuri, Jorhat. Balya Bhawan H.S., P.O.- Jorhat, Jorhat. Qualification:- Minimum HSSLC passed having diploma in computer efficiency with typewriting in both Assamese and English (D.T.P.) from Govt. recognized / Aided Institutions. Scale of Pay:- Rs.5200-20200/- (PB-2) + Grade pay -2200/- and other allowances. Age limit:- 18 years to 38 years as on 01.01.2015. Age relaxation as per rule. Written Test Exam : 22.12.2015 at 11.00 A.M. in the concerned schools. 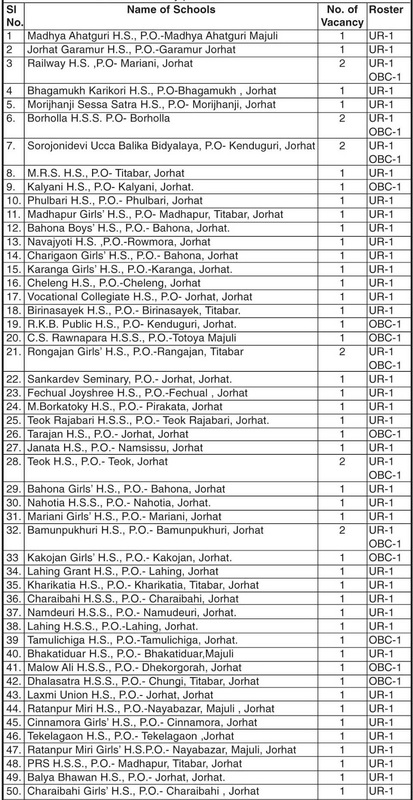 How to apply: All the intending candidates are requested to submit their applications along with necessary academic particulars on or before 18.12.2015 in the respective address of the school as shown (in the official advertisement below).